Eckankar (meaning Co-worker with God) is a non-profit religious organization and church with members in over one hundred countries. The spiritual home is the Temple of ECK in Chanhassen, Minnesota. It is a modern-day religion, introduced by Paul Twitchell in 1965, but claims ancient roots. Eckankar is not affiliated with any other religious group. Followers believe its purpose is to help individuals find their way back to God through direct personal spiritual experiences. The movement teaches simple spiritual exercises, such as singing Hu, to experience the Light and Sound of God and recognize the presence of the Holy Spirit. Harold Klemp is the present spiritual leader, known as the Mahanta or the Living ECK Master. The Eckankar website notes, "Many Eckankar terms trace their historical roots to the Far East; however, they have their own meaning and application in Eckankar." Although Paul Twitchell founded Eckankar in 1965, Eckists believe that the basis for the Eckankar teachings dates back beyond the beginning of human existence. :59  Eckankar's headquarters were originally in Menlo Park, California in 1975. In 1986, Harold Klemp moved the base of operations to Minneapolis, Minnesota. 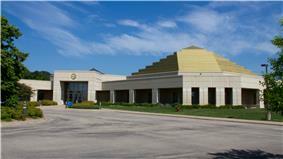 The Temple of ECK was dedicated in 1990 in Chanhassen, Minnesota. Some scholars believe that Eckankar draws in part from the Sikh religion and the Sant Mat movement. Eckankar hosts Community Hu Songs and Worship Services in many places around the world. The Community Hu Song is presented as a service to the local area and is open to people of all faiths. It consists of a 20-minute singing or chanting of the Hu followed by a five-minute contemplation. An ECK Worship service generally includes a Hu Song and contemplation, a talk or panel discussion from members of the Eckankar Clergy, and often includes creative arts and group discussion. Eckankar hosts a Worldwide Seminar in October and a Springtime Seminar every year. Eckankar also hosts annual seminars in countries around the world. ECK seminars include speakers, creative arts, workshops, discussion groups and other activities. There are a number of ceremonies an ECKist can experience as part of the teaching, including a Consecration ceremony for initiating the young and infants, a Rite of Passage into adulthood (around age 13), a Wedding ceremony, and a Memorial service. :186 In Eckankar's original form, the Consecration, Rite of Passage, and Memorial services did not exist, but were added later by Klemp. ECKists celebrate a spiritual new year on October 22. There is no organizational celebration of personal anniversaries, such as birthdays of the leaders. Klemp is the current Mahanta and thus is responsible for the development of the movement. He has authored books, articles and discourses about the teachings of ECK. Audio and video recordings are available of his talks. He grew up on a Wisconsin farm and attended divinity school. In the 1960s he began studying the teachings of ECK. After years of spiritual training he became the Mahanta, the Living ECK Master, in 1981. "He has the ability to act as both the Inner and Outer Master for students of Eckankar. ":xii Eckankar claims that "many students of Eckankar report uplifting and life changing encounters with the inner Master, Wah Z, through dreams, spiritual exercises, soul travel experiences, and other means". Klemp claims that "his teachings lift people and help them understand their own experiences in the Light and Sound of God". :xii Klemp transformed the path from an individual spiritual teaching "Ancient Science of Soul Travel" to a religion, "Religion of the Light and Sound of God". Several groups claimed to carry on the original teachings of Twitchell and Eckankar. Gross used the name Ancient Teaching of the Masters (ATOM), after being precluded from using the Eck terminology, Paul Marché claims to carry on for his Master, Gross, using the name Dhunami, after being precluded from using the ATOM terminology. Other claimants include John-Roger's Movement of Spiritual Inner Awareness, which appears to have split from the main body of Eckankar, though Gross and Marché claimed to be preserving the originality of the teachings. Former ECKist Ford Johnson formed a spiritual organization based on the idea that one does not need a master or spiritual guru to achieve spiritual enlightenment. Other former ECKists and their groups, like Michael Owens's "The Way of Truth: Path to God Realization"; Michael Turner's "Yahoo group"; Gary Olsen's "MasterPath"; former Eckankar initiate Jerry "Sur Toma" Mulvin's The Divine Science of Light and Sound; and Evan Pritchard (author, From the Temple Within) could be seen as individuals and organizations that maintain Eckankar-like cosmogonies. :59 All these groups along with Eckankar were founded in the United States in the twentieth century. Shabd" teachings, rather than a "splintering" of any movement. In explaining Twitchell's plagiarism from Julian Johnson, Lane makes note of two points: Twitchell had written all his books in the 1960s and 1970s in the US, whereas Johnson had written all his books in the 1930s in India; and Twitchell wrote in at least two publications that he considered a book edited by Johnson-- Sar Bachan-- to be his "Bible". The high teachings of ECK had been scattered to the four corners of the world. The different masters each had parts and pieces of it, but they attached little requirements, or strings, to it: You must be a vegetarian, or you have to meditate so many hours a day if you want to really be a true follower on the path to God. And this was wrong for our day and age. It was geared for another culture. Paul gathered up the whole teaching and took the best. Though it may be a strange thing to say, in this sense I see him as a master compiler. He gathered the golden teachings that were scattered around the world and made them readily available to us. So now we don't have to feel that we must spend ten or fifteen years in an ashram in India, sitting around in the dust with the flies, or locked in a walled-up little cell to keep our attention from the outside world, in order to live the spiritual life. ^ Marman's book The Whole Truth was published in January 2007. David Christopher Lane, in the Notes section of his article published in 2006 in Introduction to New and Alternative Religions in America, states that he is responding to Marman's book which was available online at the time Lane wrote his piece. ^ Chryssides, George D. (2001). The A to Z of New Religious Movements. Oxford, UK: Scarecrow Press. p. 298. Johnson, Ford. Confessions of a God Seeker: A Journey to Higher Consciousness, ONE Publishing. Twitchell, Paul (1988). The Shariyat-Ki-Sugmad, Books One and Two, Menlo Park: IWP; Minneapolis: Eckankar.